Summer time is great. The sun is out, people are happier, and the days feel so much longer. Summer is perfect in most ways except for the fact that it seems harder to get a board game night together as people always seem to have something to do! This week I was lucky enough to get two nights of gaming in..
Last Will: A game I've owned for a while and was pretty intrigued by the theme, style of art and general concept before I actually purchased it. Yet here we are months later and I only finally managed to get it to the table! Twice too. Was it worth the wait? Well initial plays were just OK. There's nothing wrong with the game but I didn't immediately love it. Like I thought I would, I enjoy the theme and the concept of trying to get rid of your money as fast as you can, but something about Last Will doesn't grab me where I'm dying to get it back to the table again. With that said it will be making its way back to the table tonight so it can't be all bad can it? Roll For The Galaxy: The problem with having too many games is that you end up with too many games that you want to play and could be playing, but can't because your playing something else! Case in point - Roll For The Galaxy. I love this game and hadn't played it for a few months simply because I have been busy playing other games. But I was glad to bring it out again and it instantly reminded me of why I enjoy it so much. Dice rollers are always a bit of senseless fun, but RFTG has strategy, engine building and time constraints knowing that one of your opponents could end the game before your ready. Everything about the game is well designed and I'm glad I had the opportunity to not only play it again for the first time in forever, but I also got to teach it to someone new - and that is one of the finer joys of board gaming. Sadly nothing.. I'm on a tight budget at the moment and are waiting for some end of year sales! Here's a few on my radar though..
Agricola - The classic and quintessential worker placement board game and yet I've never tried it. About time I change that! 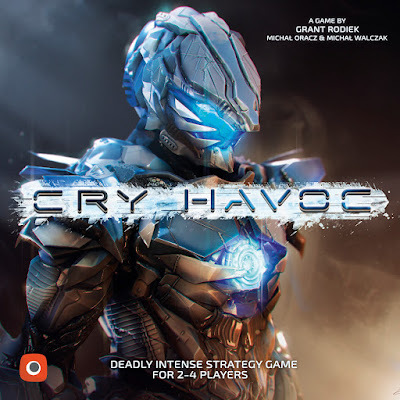 Cry Havoc - I've heard nothing but good things about this area control game. I purposely haven't looked into it too much as I can already tell I'll enjoy it. Mr Jack - I love a good two player game and asymmetric games are some of my favourite (as Cry Havoc also is!). Mr Jack has a 10th anniversary edition so I'm hoping it'll be a little easier to track down - although I do hear Mr Jack in New York is better.. So until I see a good sale (happy to wait until boxing day if need be) those three board games remain on my wish list.